Main Street Gazette: Vote for Hook or else! Today is Election Day. If you are able, I strongly suggest that you exercise your civic duty and vote today. Who you vote for and what offices you vote for are your choices, and these are not a topics up for discussion here, but even Walt Disney himself would “get red, white, and blue at times,” and I think it is a sentiment we should all share. In honor of Election Day, we’ll take a look at the Main Street Mascot Ballot. 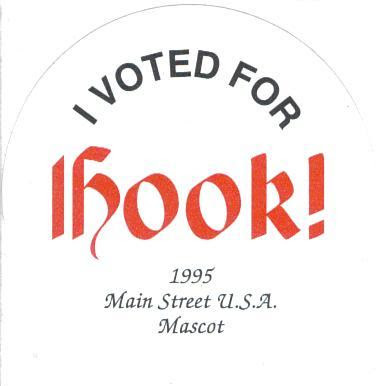 During 1995 you could pick up a ballot at either Exposition Hall or the Emporium and vote for Pooh or Captain Hook. Rallies for the candidates were held each morning with the results being announced at a ceremony later in the day. Surprisingly, or perhaps not so surprisingly, the good Captain seemed to win more often than not (though I am unable to confirm whether or not he won every contest). As you returned your ballots, you were presented with a sticker that showed that you voted. Unlike our everyday “I Voted” stickers, these stickers also proclaimed which candidate you had voted for.